That second, I mean that second, Eric Clapton played the opening riff to his version of Crossroad Blues onstage at Madison Square. I’m not particularly superstitious, but I think I had to put the maps down for a few minutes. I’m still not sure what to take away from the whole thing, but we decided we had to get to the Crossroads. Easier said than done. The Crossroads myth is a slippery one. Many historians feel confident that it’s a story Johnson never told about himself, and it seems likely that if he felt that he’d sold his soul to the devil it had to do with the fact that he was playing secular music, which was scandalous to many Delta residents at the time, not that he’d entered into some Faustian contract. Some sources claim white writers first popularized the tale in articles on the Delta blues. Others claim contemporaries of Johnson’s began telling the story after his death. To muddy the waters further (see what I did there?) next to nothing is known with any certainty about Johnson’s life, let alone about the origins of the story of his pact with the devil, which makes him seem all the more mysterious. Although it’s probably not surprising, as he was a man who was born in a poor area in a much less literate time period. To add fuel to the fire he is a member of the 27 Club, died under mysterious circumstances, and he supposedly would practice in graveyards. Not surprisingly, the Crossroads itself is hard to find. Several towns claim the Crossroads for different reasons. Rosedale is largely thought to be the Crossroads because of the Clapton version of Johnson’s Crossroad Blues. But interestingly, if you look at Johnson’s original, no mention of Rosedale is made. Clapton’s version removes the lines “Standin at the crossroad baby, risin sun goin down/I believe to my soul now, poor Bob is sinkin down” and “I went to the crossroad baby I looked east and west/Lord, I didn’t have no sweet woman oh-well babe, in my distress” and adds “I’m going down to Rosedale, take my rider by my side/You can still barrelhouse, baby, on the riverside,” a line that’s actually from Johnson’s Traveling Riverside Blues, this blog’s namesake. Looking at Johnson’s version of the song it’s not at all clear what the singer is feeling (aside from the blues). It could be about being afraid of the powerful demon he knows he will meet at the crossroads after dark. But it could also be about being lonely and wanting a woman. Also very likely, it could be about being a young black man who needs a ride because he’s afraid of being caught out after dark in 1930s rural Mississippi, a possible meaning that is lost in Clapton’s version, obviously. Which brings us (literally) to Clarksdale. 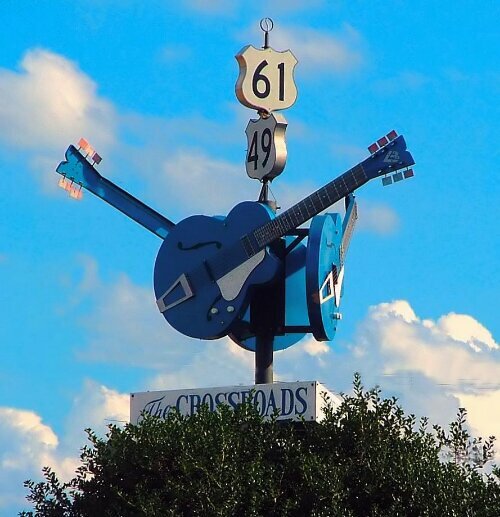 Clarksdale also claims to be the Crossroads, a claim that gathers most of its legitimacy from this sign. We called John Ruskey, Lower River paddler, painter, musician and owner of Quapaw Canoe Outfitter as soon as we got to Helena, AR and asked if there was a way to get to Clarksdale. Turns out he lives there and it’s the main branch of Quapaw. 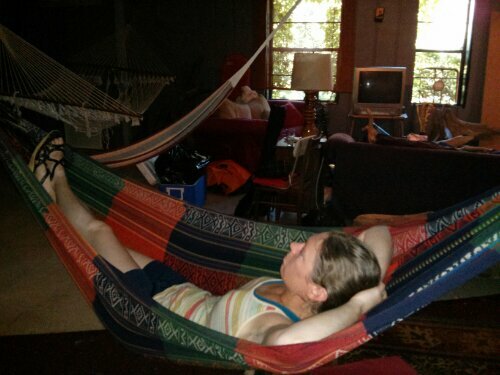 So we’ve been staying in the youth hostel in the main building, which boasts four hammocks and a swing bed. We’ve also hit everything one should hit in Clarksdale. 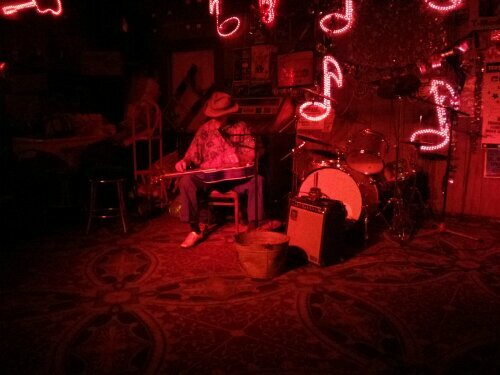 The Delta Blues Museum (where you are not allowed to take pictures) and the juke joints, where last night we saw Watermelon Slim, who was taught by George Mayweather, who in turn was taught by Muddy Waters. 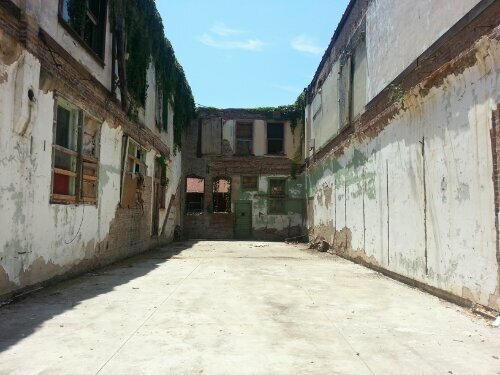 Clarksdale has seen better days, no doubt, but there’s some revitalization going on. 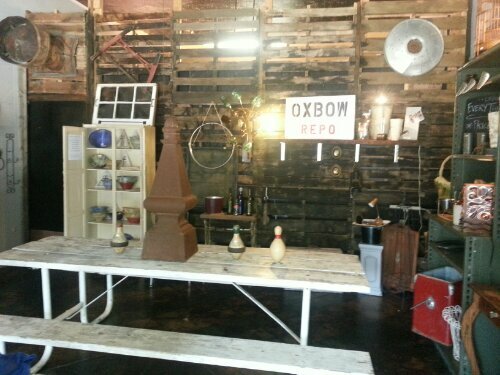 Thanks to John himself, for one, and also people like the owners of Oxbow Cafe. I also have to say Clarksdale is an incredibly friendly place. More people have said hi on the street than not. 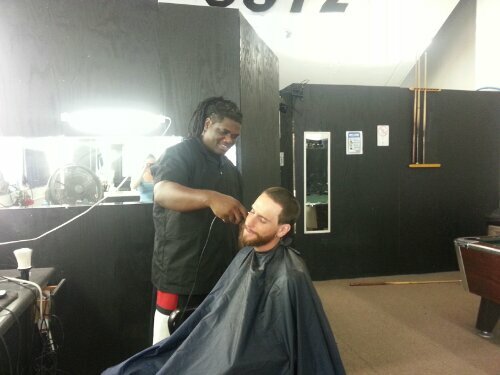 And I can also tell you that if you stand in front of Cutz on Yazoo Ave long enough an employee might just drive by and open the place up to give you a haircut. Leaving the blues museum a man in a car flagged us down and asked “Didn’t I see you at Red’s last night?” His name turned out to be Josh Razorblade Stewart and he had played that night as well, though we’d missed him. He tried to talk us into buying one of his CDs but after we explained we’d canoed to Clarksdale and didn’t have a CD player he gave it to us. Then he asked if we’d heard of Robert Johnson’s Crossroads. Have we? He explained he had his own. He drew a dollar sign on a piece of paper. The “s” is a snake, he explained. The lower left end is the tail, the upper right the head. The three times it crosses the straight lines are the three crossroads of a life, in a person’s 20s, 40s and 60s. He’d passed the 60s crossroads, he said, but wasn’t ready for the mouth of the snake yet. And thanks to him, we’ve had our own crossroads experience. Delta win. 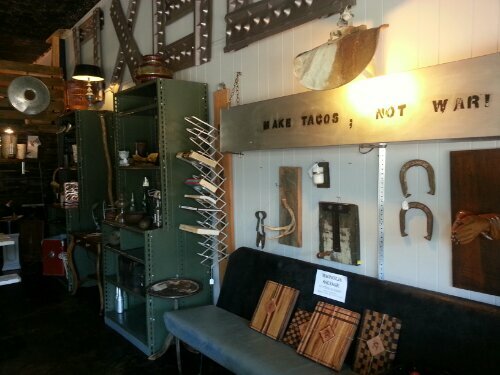 This entry was posted in Arkansas, Mississippi by Linnea. Bookmark the permalink. A day in the life of travelers! What a story…finding legends, lots of music, good folk, memories forever. Your storytelling (both of you) brings me to the location. Keep the stories coming! Dumb question maybe, is a juke joint a bar with a jukebox in it? It sounds more mystical than that. There’s no jukebox because it’s all live blues musics! 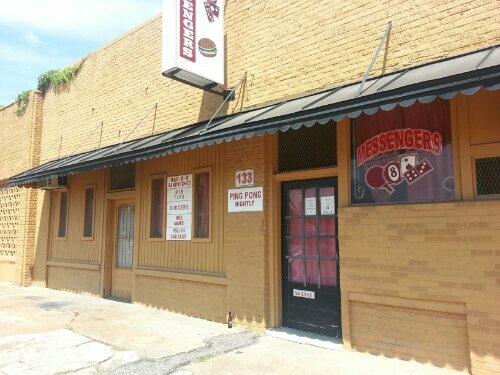 I THINK I heard that to officially be a juke joint the owner has to live there but many these days do not. I am excited to watch that when I have WiFi! That is such a healthy beard. For sure! And hopefully we’ll see you when we pick up the gear we left in the youth hostel to lighten the canoe. Just got back from my own vacation out to Yellowstone and the Black Hills. I was looking at your map at it appears you are about two thirds of the way to your goal. Good for you! The experiences you talk about in this post are the things I crave to experience myself one day. At 53 I’m not getting any younger but it’s hard if not impossible to get the amount of time off it would take to complete such an endeavor. True, I had to quit my job too do it. Hope trip was great! I’d definitely get to Clarksdale if you have a chance to go. My wife and I did Indianapolis, IN to New Orleans last summer. I remember Helena very well. We stayed at a Bed ‘n’ Breakfast there for our only real showers of the trip. Best of luck the rest of the way! The river gets really big around Baton Rouge. Nice! We didn’t spend much time in Helena, we ditched it for Clarksdale. Next time! If you want more, visit all 3 of Robert Johnsons graves. They’re in the area too. Ha, we saw that there are three at the blues museum. Wish we could’ve driven around to them. I have enjoyed your blog since the beginning of the trip. What a fabulous time! Thanks for sharing your experiences! Thank you! Glad it’s fun and not boring to read! FINALLY catching up … I’ve got a lot of reading to do. and it sure has been a lot of “goin down” to get there for you two. But, I never knew where, or I guess cared where Rosedale was. Very fun and interesting stuff to mention on your journey. problem, Linnea-your Aunt told about that. Hope you’re 100 % ! Oh, and congrats ! I didn’t know … see you at the wedding ! Thanks Jim! Will keep the updates coming. We passed thru clarskdale last week on a musical tour thru nashville, muscle shoals, tupelo, vicksburg, clarksdale, memphis, and st. louis. we also had the good fortune to run into razorblade stewart, hear his story (of the $ sign and crossroads), and buy his CD. It really is a pretty good CD and the sound quality is very good. After touring the delta blues museum, my wife finally understands the story behind the blues, how it is the first real American music form, and how it led to the development of so many other popular music forms. Amazing! Sounds like a great trip! Wish we could have kept his CD — we didn’t want to bring it on the river.